Saturnus Mons was the home and possibly the original site (birth place) of the roman agricultural god Saturn although it remains unclear wether or not the etruscian god of a similar name but different qualities under the name of Satre – often interpreted as the equivalent of Saturn had preceded Saturn. The Temple of Saturn located right at the foot of Capitoline Hill (former Saturnus Mons) is the oldest temple on the Forum Romanum and the second oldest known temple in Rome (next to the ancient temple found near the church Sant Omobono). The Saturn Temple is considered as of greatest importance in the classical history of the City of Rome. The position of the Saturn Temple at the foot of Saturnus Mons could even be a hint that the origin of Saturn might be at the site of Saturnus Mons itself. Astrogeographic position of Mons Saturnus (Capitoline Hill) and Forum Romanum the heart and center of the ancient City of Rome for morphogenetic field level 3 which describes the atmosphere, energetical topics and how the site is embedded in the city of Rome: the coordinate for the astrogeographical longitude position of the whole larger area that includes Capitoline Hill and Forum Romanum to the east at the foot of Capitoline Hill lies in mystic, spiritual water sign Pisces. Pisces represents the sign of imagination, the dream world, mystification, illusion, temples, italian culture and within cities an important indicator for open spaces dedicated to recreation. Pisces is the indicator for the role of the area of Capitoline Hill and Forum Romanum as an important site of temples, baths and and buildings dedicated to the mystification and glorification of Rome and its emperors. For this role of Pisces compare: Temple Mount, Lincoln Memorial, Mount Olympus, Glastonbury Abbey. The coordinate for the astrogeographical latitude falls in highly defensive, conservative, traditionalistic, strict earth sign Capricorn the sign of fortresses, control, government institutions, rules and regulations, public space and indicator for the prominent role of the forum to serve representative functions and as the center of government institutions. Apart from that Capricornas the sign of mountains and rocks is the indicator for the hill on which the central government buildings were erected. The Temple of Saturn was where the Empire`s treasures and its reserves of gold and silver were kept together with the state archives, the insignia, written laws and the official scale for the weighing of metals. All these functions of the temple of Saturn directly correspond with the topics assigned to Saturn in astrology. This strongest imaginable visibility of the resonance of Saturn at a place is astrogeographically reflected in the position of the site in Capricorn the sign of Saturn`s rulership: Saturn as the ruler of Capricorn resided in his own sign and territory here. No other astrological sign can be imagined which would be more symptomatic and auspiscious for these purposes than defensive, conservative, traditionalistic, strict, hierarchical earth sign Capricorn the sign of control and most important indicator for all aspects of government institutions. 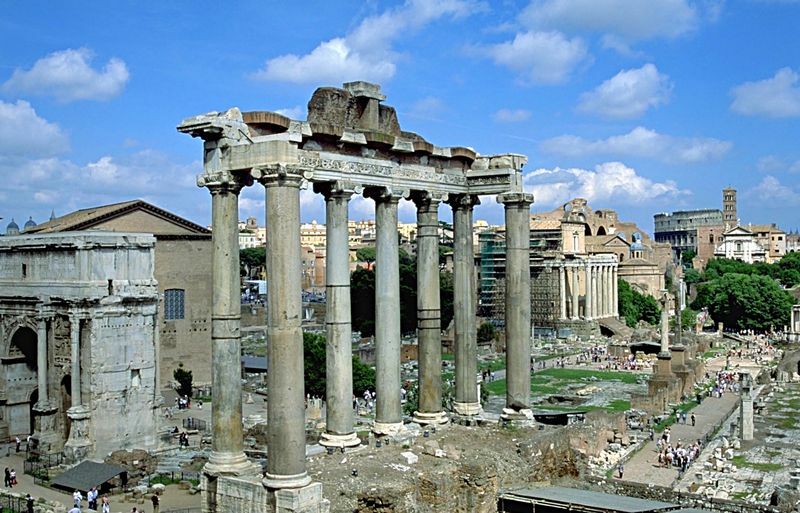 The Temple of Saturn was the central site for the festival of the Saturnalia a yearly festival celebrated for several days around the winter solstice starting from 17 December. Astrologically it falls in the period of the Sun`s transit from the last degrees of Sagittarius into Capricorn. For the northern hemisphere the winter solstice on 22°December marks the time of the year when the period of decreasing daylight and shortening days ends and days start getting longer. 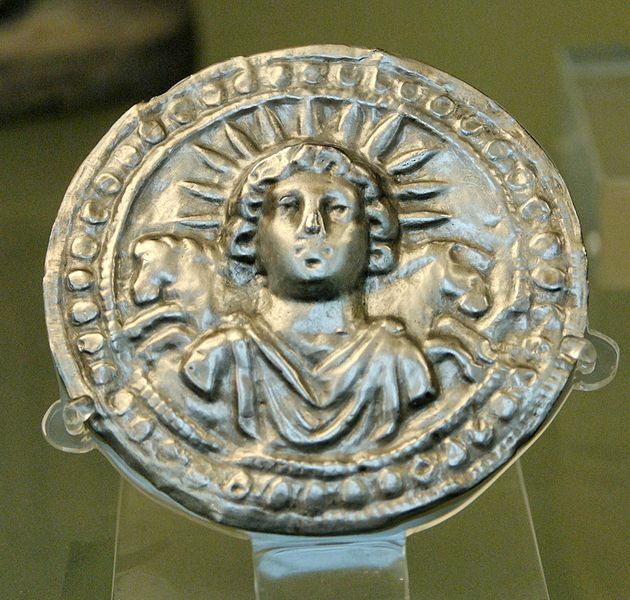 During the Saturnalia the confrontation of Sagittarius (maximal darkness) and Capricorn (minimal daylight) was celebrated as the victory of the Sol Invictus or undefeated sun. In ancient astrology Saturn was feared as the guardian of fate and seen as the punishing, problem causing and evil-doing factor in astrology. At that time Saturn ruled the two neighbour sign Capricorn and Aquarius. 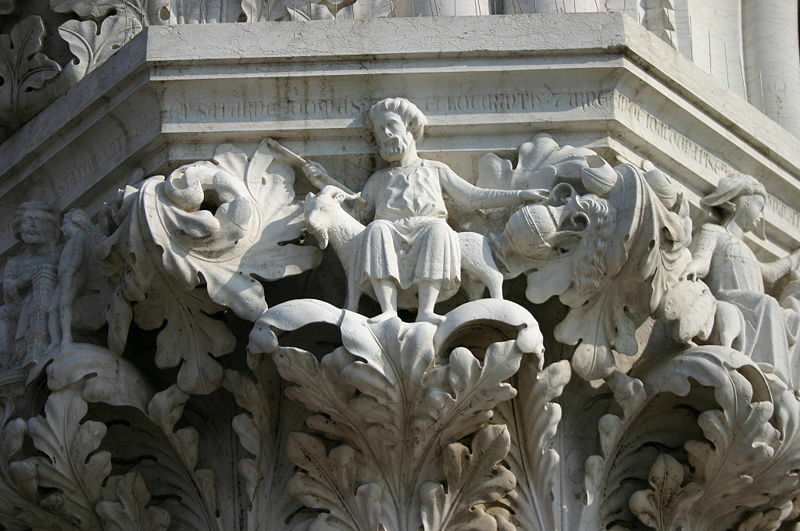 The presentation of Saturn riding his goat as the controler over agriculture while watering the fields combines these two aspects. The astrological problem here is that the incompatibility of unconditional service to the ruling classes (Capricorn) and emancipation of individuality from suppression (Aquarius) was widely ignored. Astrogeographic position of Mons Saturnus (Capitoline Hill) and Forum Romanum the heart and center of the ancient City of Rome for morphogenetic field level 1 which describes the international, global level of resonance of the origin of Saturn: the origin of Saturn at Mons Saturnus falls on the degrees 29°Gemini and 15°Gemini. 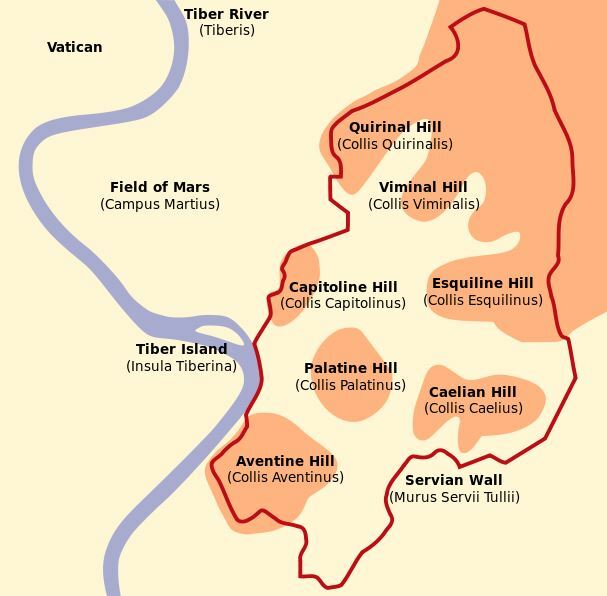 According to Roman tradition Romulus founded the city of Rome on the Palatine Hill located 300 m to the south of Capitoline Hill on April 21st, 753 BCE. The area of Palatine Hill has the astrogeographical latiutude coordinate in air sign Aquarius and the coordinate for the astrogeographical longitude lies in the same sign as Capitoline Hill: water sign Pisces. The date of the legendary foundation of the City of Rome saw Jupiter at 12°53` Pisces and not Saturn transiting the coordinate for the astrogeographical longitude position of both Capitoline Hill and Palatine Hill in Pisces. Jupiter as the planet of expansion was an intensely positive indication of the auspiscious and supporting situation and moment for a foundation of the city at these places. This concidence is an early hint at why about 200 years later Jupiter was decided for as the future main deity of the City of Rome. 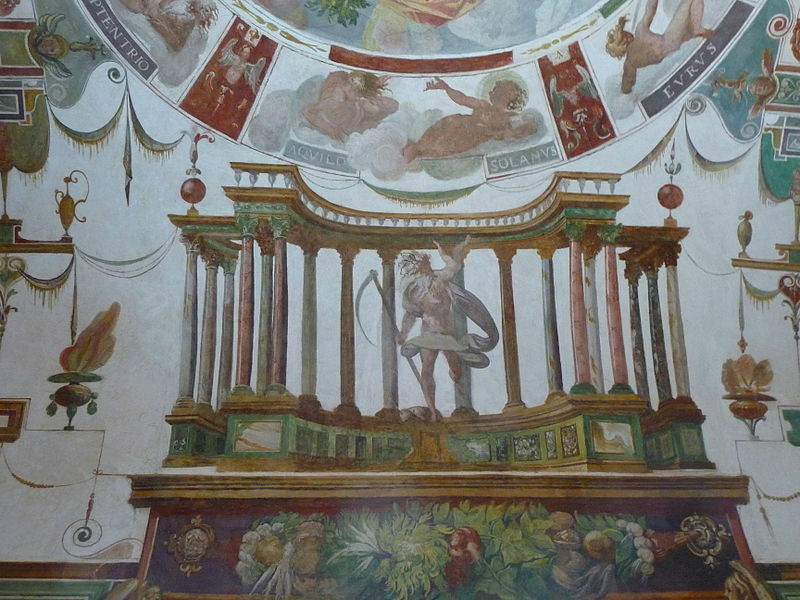 Jupiter took over Saturn`s place as the god of Capitoline Hill. Anyway from the point of view of ancient astrology Jupiter was in his own sign in Pisces. 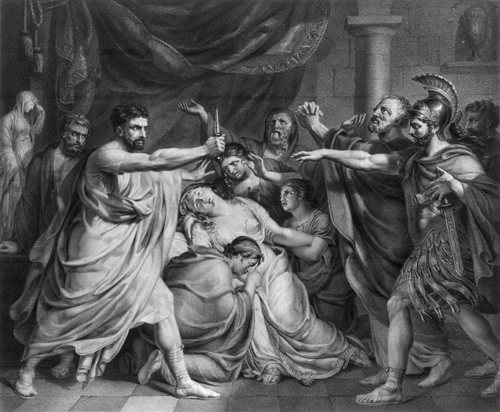 In the year of 509 BC Tarquinius Superbus the 7th and final King of Rome was deposed as ruler over Rome through a popular uprising and the Republic of Lucius Junius Brutus as its first Consul was founded instead. This led to the change of the state religion dogma and the construction of a new central temple for the City of Rome on Capitolline Hill. It was built and consecrated in 509 BC under the name of Temple of Jupiter Optimus Maximus. Jupiter Capitollinus took over Saturn`s position and was made the official state god of Rome as the god of the republic. In ancient astrology Jupiter ruled two signs: Sagittarius and Pisces. From that point of view Jupiter actually occupied his own sign Pisces during the foundation of process of the Roman Empire. Compare my article: On the competition between Poseidon and Zeus aka Neptune and Jupiter. 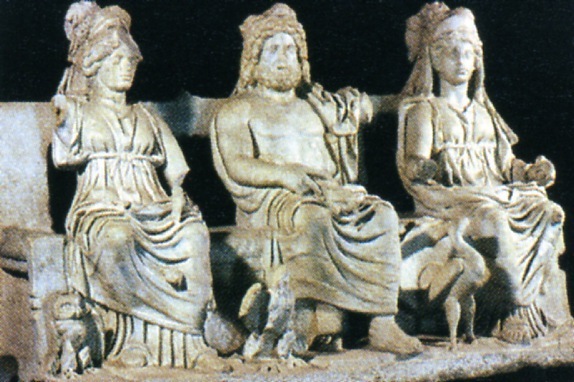 The Capitoline Triad of Jupiter, Juno and Minerva replaced the outlived, rural, agricultural Saturn with the more fashionable panorama of two beautiful female goddesses who served to surround a single male god in the center of the official state religion. Astrologically this decision replaced the dominance of the Capricorn coordinate that stood for hard labour, austerity, responsibility, traditionalism and strict rules through the shift to mystifiying, illusionary and Hollywood related aspects of the Pisces astrogeographical resonance of Capitoline Hill. The shift from Saturn to Jupiter corresponds with the traditions in greek mythology: The roman god Saturn is associated with the greek god Chronos and of roman god Jupiter with the greek Zeus. It can be assumed that what is describes here is the shift from the era of the reign of agriculture (Chronos/Saturn) to the reign of city culture (Zeus/Jupiter). The spring equinox is the mundane birth day of each solar year. The Sun enters into Aries starting a new year cycle. 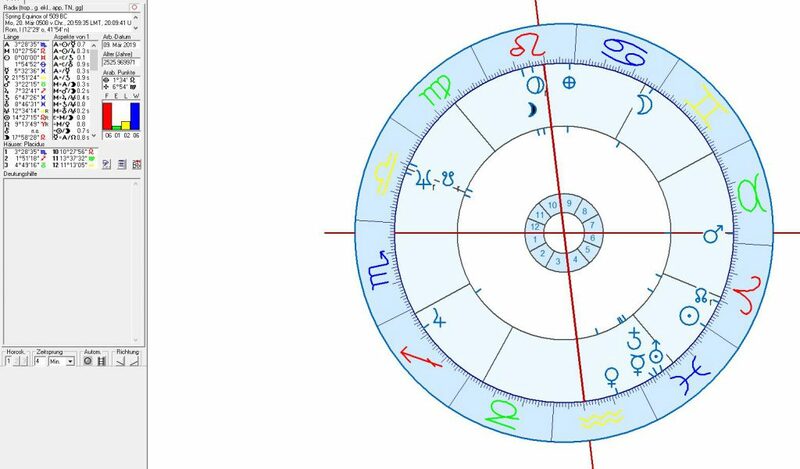 The planetary positions in the signs and houses explain the cosmic resonance topics of that new year for the particular place for which the chart is calculated. 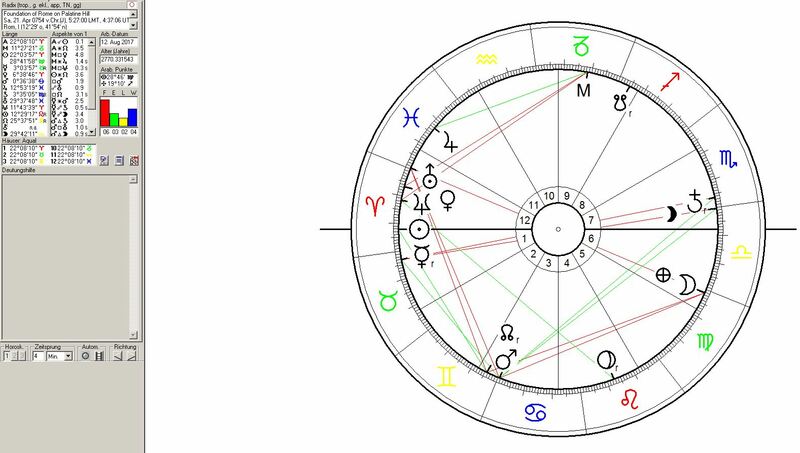 The spring equinox of 509 BC (astronomically 508 BC) saw Saturn the ruler of the Capricorn resonance coordinate of Capitoline Hill conjunct Uranus the planet of revolution, reconnection and self-liberation and in Pisces the 2nd astrogeographical coordinate of Capitoline Hill. Jupiter himself was at 7°32 in his own sign Sagittarius and in house 2 the house of posssession of territory challenging Saturn the old ruler of Capitoline Hill at 6°47 Pisces in house 4 the house of ancestry through an exact square. The fact that Pisces represents the sign of mythology and spirituality delivers a plausible explanation for the simultaneous change of the political as well as of the spiritual guards on Capitoline Hill.